BEIJING, March 13, 2019 /PRNewswire/ -- The World Economic Forum (WEF) released on Wednesday a list of 127 new members of Young Global Leaders, which is made up of outstanding young people from various fields under the age of 40. 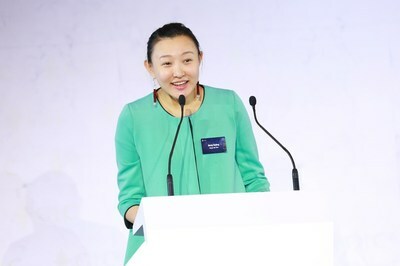 Gong Rujing, founder and chairwoman of Happy Life Technology (HLT) and its affiliate Yidu Cloud, has been entitled Young Global Leader for 2019. The list also includes Carlos Alvarado Quesada, president of Costa Rica and Ruba Borno, vice president of Cisco. These enterprising young leaders have contributed to sustainable social development in a new way under the spirit of innovation. The Forum of Young Global Leaders was established by Professor Klaus Schwab, founder and executive chairman of the WEF, in 2004 as a way of helping the world meet increasingly complex and interrelated challenges. Its members range from policymakers and Fortune 500 entrepreneurs to Nobel Prize and Oscar Winners, as well as UN Goodwill Ambassadors. The forum has caught global attention for its rigorous selection criteria, which requires the nominees to have extraordinary achievements in their own fields, considerable influence and leadership, a strong will to serve the society, and desire to resolve some of the world's toughest challenges with their talents. Being named a Young Global Leader, Rujing said, "I will strive to lead a team of people holding beliefs of 'Nature and Kindness' to make more achievements, bring together more talents to improve global AI-enabled healthcare, and accelerate the progress of green healthcare empowered by data intelligence." HLT and its founder Rujing have been widely recognized for always remembering why they started. Rujing used to engage deeply in NGO projects such as voluntary teaching and environment protection when she was studying in the UK. These experiences reinforced her view that social problems such as poverty and imbalance of education and medical resources result from a series of factors, and the power of an individual is often not enough to solve fundamental contradictions. For example, during her voluntary teaching in Cuba, she found a lot of excellent graduates cannot get rid of poverty. Inspired by her work in the investment banking sector, she realized that AI-enabled healthcare would be significant in the next 5-10 years in solving social issues such as an aging global population. Therefore, in 2012, she made up her mind to set up a business aiming at transforming the relationship between human and diseases. HLT was founded in 2013 and now has offices in six cities and regions, including Beijing, Shanghai and Guizhou, a province located in Southwest China. The corporate has a team of over 500 data engineers and has invested more than RMB 1 billion in research and development. Meanwhile, it has established close relationships with governments and universities around the world as well as multiple players in related industries. Now a majority of 150 top-class hospitals in China have adopted Yidu Cloud's data processing systems. In the 2018 Future Medicine Top 100 list, Yidu Cloud ranked the 6th with a valuation of RMB 12 billion. In the Top 20 Chinese Big Data Unicorns published by People's Daily Online, Yidu Cloud ranked the 15th. Its self-developed Data Process & Application Platform (DPAP) also won an Award for the Best AI Medical Product, which was launched by the China Internet Weekly of the Chinese Academy of Sciences. Also, by working with top-level experts in China, the company has published more than 40 high-quality papers in the past two years, with some of which in leading medical journals such as the Lancet Oncology and the Nature Medicine. Rujing has recently established the ChildrenSmile Foundation and plans to donate USD 5 million and part of her company shares worth several hundred million US dollars within three years. The foundation is dedicated to supporting basic medical research, especially fundamental scientific research platforms focusing on rare diseases in children, which will help improve the health and living conditions of children with rare diseases.